I spent Friday night in Memphis with my cousin and friend to see our favorite band of all-time (and the staple of my formative teen years): Duran Duran. Thanks to a great deal via the Priceline Negotiator (insert image of William Shatner doing a karate chop here), we ended up with a hotel room for the night at the world famous The Peabody hotel. For a not-so- world-famous price. Now growing up, we thought The Peabody Hotel was the creme de la creme – the place where celebrities and presidents slept when they were in town. I have to admit that it didn’t disappoint. In a world of modern black and white hotels with minimal design, The Peabody stands out as an old Southern charming classic. Upon arrival (after a hefty hike from the parking lot – thank goodness for wheeled baggage), we were greeted with a smile and settled into our room to get ready for the concert. 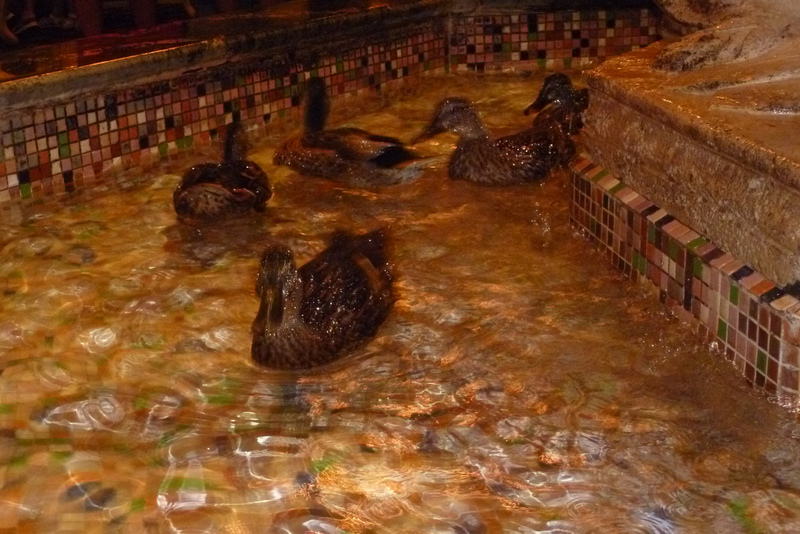 We caught the tail end (pun intended) of the ducks marching back up to the roof (the ducks are a Peabody tradition – they swim in the fountain every day in the hotel lobby) and then headed out to the venue where Duran Duran were playing. The venue was the Memphis Botanic Garden. A few things about this place ROYALLY sucked. First, parking was nearly 1/4 of a mile away. Secondly, if you’re a fan of the band and actually want a decent seat – forget it. Those tables that are up front are bought in advance by those people and corporations who support the garden. And let me tell you, there weren’t a lot of Duranies amongst those people. I mean, really, WHY COME TO A CONCERT OF A BAND THAT YOU DON’T EVEN LIKE? And we were told that even empty tables would just stay empty – they wouldn’t be up for sale later. You know, like at a REAL concert venue. To be honest, I was a little irked about that situation. And guess what? When the band started playing, they picked up on the fact that the loudest screamers and most lively dancers were those behind the fence behind the tables. Lead singer Simon LeBon commented on it and pretty much told us that we were the ones they were performing for. And they did. They performed for us. Even their back-up singer told those in the front to get off their butts and onto their feet and DANCE. Ridiculous. We met some lovely girls from Louisville. They told me they saw me dancing up near the fence and wanted to come hang with us because we looked like we were having fun. They were so sweet. Their mother (who is now deceased) was a Duranie and passed it onto them. This was their first Duran Duran concert. This was, literally, a dream come true for them. THIS, this reminded me of why I loved this band so darn much (besides the fact that they brought the house down in spite of the boring folks up front). The show was great. I got yet another Duran Duran t-shirt. And we hiked the 1/4 mile back to the car after it was done to go freshen up at the hotel. Freshen up = change shirts and shoes. And then we hit Beale Street, which was PUMPING, thanks to it being Elvis Week in Memphis. We ended up at the Hard Rock, starved and needing beverages. And that’s where we saw all the Elvis impersonators doing karaoke. It was AWESOME. And another lesson in fandom. Elvis is the ONLY musician, who has inspired such ardor so long after his death. He truly is a legend. People from all over the world are in Memphis to celebrate the life and music of this one man who touched them. And we had come to Memphis to pay tribute to the band that had touched us. It sort of fit to see that after the concert. But wait! It gets better! After a margarita and way too much food, we went back to the hotel, only to see Lisa Marie Presley hanging out in the lobby. At that point, chalk it up to being a perfect night. Even if it all feels completely unreal right now. Oh, and look at the cute little ducks! We got to see them march to the fountain this morning. A good time was had by all is an understatement. But now, I believe I need to sleep. And yes, it’s true: Elvis has left the building.